Pollution same as smoking 15-20 cigarettes a day, ‘severe’ deterioration from Mon likely. New Delhi: Doctors in the national capital on Saturday said the impact of air pollution on public health can be compared to smoking of 15-20 cigarettes a day. Delhi’s air pollution level dipped slightly on Saturday, but remained in the “very poor” category due to control measures by authorities and stagnant meteorological conditions. 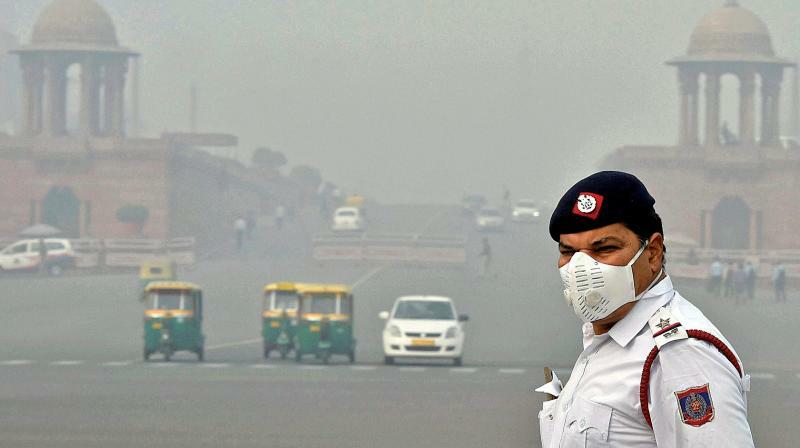 The officials, however, warned of deterioration in air quality to “severe” levels from Monday even as authorities imposed penalties of over `80 lakh for violations of pollution control norms. The air quality index (AQI) has “improved to the lower range of “very poor” category despite adverse weather conditions, reflecting the impact of reduced base emission”, a report by System of Air Quality Forecasting and Research (SAFAR), under Ministry of Earth Sciences said. “I have seen a change in the colour of lungs over the past 30 years that I have been operating. Earlier, I used to see black deposits only in smokers and others would have pink lungs. “But, nowadays, I only see black lungs. Even teenagers have black spots on their lungs. This is frightening. With this unique installation, we hope to show people the reality of what’s happening to their lungs”, said Dr Arvind Kumar, founder trustee, Lung Care Foundation, chairman — Centre for Chest Surgery, Sir Ganga Ram Hospital. “The impact of the foul air on public health can be compared to smoking 15-20 cigarettes a day,” he said. To showcase the ill effects of air pollution, an installation depicting human lungs was unveiled at a city hospital Saturday. The lungs in the installation are fitted with white Hepa Filters, which due to exposure to Delhi air will turn black, demonstrating the impact of air pollution on healthy lungs, a statement issued by Sir Ganga Ram hospital said. The installation is a part of a campaign launched by the Help Delhi Breathe initiative, the Lung Care Foundation and the hospital, it said. The overall air quality index (AQI) of Delhi was recorded at 346, which falls in the “very poor” category, according to data of the Central Pollution Control Board (CPCB). Wazirpur recorded “severe” quality air, while air quality in 34 other areas were “very poor”, according to the CPCB data. The PM2.5 level was recorded at 175. Fine particulates can be a matter of serious health concern than PM10 (particles in the air with a diameter of less than 10 micrometres). Ghaziabad, Faridabad, Gurgaon, Noida and Greater Noida all recorded “very poor” air quality, according to the data.